So Williams, 52, founded Field Goods as a farm-to-office subscription food delivery service. She raided her own savings for start-up cash and got a $25,000 micro-enterprise grant from the county. She worked with a few local farmers at first, delivering the produce herself to her 60 customers in an old station wagon. Since then Field Goods has come a long way. The company now delivers to about 3,500 subscribers at 510 workplaces and community centers in eastern New York State and the metro NY area including western Connecticut and northern New Jersey. She employs 33 full and part-time workers at her 18,000 square-foot cold storage warehouse and reports that sales have been doubling every year. Regional food hubs, either for-profit or nonprofit entities that aggregate and distribute food from local farms, are springing up all over the country, according to Modern Farmer. But these are CSAs, which tend to serve relatively small numbers of people who generally have to pay upfront at the beginning of the growing season. 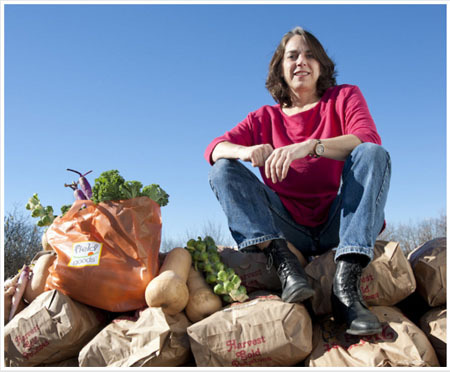 “The reality for the rest of us folks is that we’re not going to a farm.” So she decided to ‘suburbanize’ the CSA concept and make it a whole lot easier for people to eat their veggies. The program delivers to about a hundred public and private sites around New York City, for example. A private site (such as the New Rochelle City Hall on Wednesday afternoons) is for employees or members at an institution or firm, and a public one (such as the Scarsdale public library on Wednesday afternoons and evenings) is for anyone who joins. Subscribers pay by the week — $15 for the smallest bag up to $30 for the largest — and if they want to put their deliveries on hold, they can do so. They can also add on locally produced specialty items to their weekly delivery, such as fresh-baked bread, cooking oils, butter and cheese. Typically, there are about seven or eight different items in the bags each week. One of Field Goods most popular items is the “fingerling” sweet potato. In fact, there’s no such vegetable — these are sweet potatoes that haven’t matured fully and wouldn’t make the cut in a giant supermarket. But people love them, says Donna. “They’re really ugly and funky-looking.” Field Goods also provides a market for quirkier specialty crops, like eschalions, a cross between a shallot and an onion, and kale sprouts, a brussel sprouts-kale hybrid. The company has purchased more than $4 million in local food products and works with a network of 80 farmers in the region. Adam Hainer runs Juniper Hill, a 40-acre certified organic farm nestled in the Adirondack Mountains in Wadhams, NY. Working with Field Goods has enabled him to scale more quickly than he could have by just supplying his CSA customers with produce. His business used to taper off after the busy summer season, but now Field Goods provides a market well into the fall and winter for the farm’s root vegetables. This software helps Field Goods maintain and improve its relationships with producers by making collaboration easier. These relationships are essential to Field Goods’ success because their model relies on trust and cooperation. In The Field allows producers to more easily share information, such as crop availability and desired price, and makes it possible for Field Goods to manage orders and request specific products. By reducing the costs of managing the supply chain and increasing transparency, this new tool lets Field Goods continue to partner with a broad range of local producers even as they scale up the business. Employers such as Albany Medical Center, baby food maker BeechNut Nutrition Corp., Blue Sky Studios in Greenwich, CT, and FujiFilm, with locations in Stamford, CT, and Valhalla, NY have joined. Three of those signed on for ‘BEETCamp,’ a 10-week wellness program where the company subsidizes their employees’ weekly Field Goods subscription. Workers also get a newsletter with recipes and nutritional information. “We have tried dozens of wellness programs and none has come close to the popularity and impact of Field Goods,“ said Carolyn Gordon, director of benefits at Fujifilm Holdings America Corp.
“We’re getting more and more people hearing about us and calling us,” Donna remarks. “A lot of small companies and regular people say they heard about us and ask ‘can you come to our company.’ And we say, ‘sure.’ She is presently evaluating the Boston market as a base for expanding out the program to neighboring states.